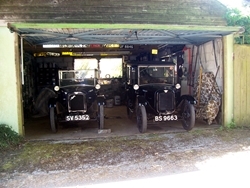 So, yet another Seven in the garage, then! I didn’t mean to, honest. I just went to view a couple of spare parts that may be useful in the future, bought them and came back with another Seven tucked under my arm as it were. 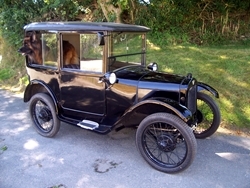 This time it was an 'R' Type Saloon first registered in July 1928. Lurking in the back of a garage looking so sad was this forlorn car, which obviously had not turned a wheel in a long time. Four near flat tyres and covered in grey dust did not twang the ‘must have’ strings at all until it was mentioned that it must go to make space. Trying to look disinterested I found that the chassis plate to be very close to my Chummy so I casually asked if it started – ‘think so’ was the reply, fuel added and starter churned round with gusto, that starter is fast thought I but as far as starting and running – as dead as the proverbial Dodo, no cough, backfire, grunt, nothing. The answer to all this inactivity was “well it was running fine until it stopped”, make of that what you will. So I made a silly offer with the car being a non-runner and it was promptly accepted. Blast, maybe I could have tried an even lower offer but too late now. The car was collected and brought home with my pal David, a fellow Club member who has a MK1 Ruby, riding shot-gun. All went well until we tried pushing the beast up the small but sharp slope into the garage, neither of us strong enough to push but remembering the old trick of selecting first gear and winding the car into the garage worked a treat. David was impressed! 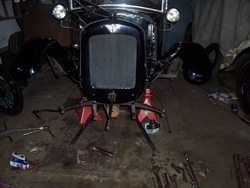 It is all too easy to try getting the engine running at this stage but I am so glad I didn’t attempt it. After winding the engine over with and without plugs and finding no difference in effort required sort of made me wonder if all was well inside the engine. Off with its head consisted of cutting the hoses off first as they were rock hard, to find inside – oh dear, more carbon than in a pencil factory, stuck valves but bores surprisingly good. At a stage such as this it becomes a toss up whether to remove the engine and box and then inspect everything in relative comfort of the bench, or workmate in my case. Being curious and 45 odd minutes later had the engine etc. resting on the workmate - getting faster with this engine out lark. Overheating? Check yopur side water passages. What was becoming apparent was where one or more adjacent parts were relatively new others were in a terrible state, i.e. hoses for starters. This kept appearing and hopefully pictures will be forthcoming of some of the ‘gems’. Removing the sump for instance revealed enough sand to make a sandcastle if rather sticky. Bluish valves, very pretty but springs OK as were the bearings (how in that grit bath?). 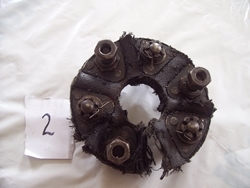 The camshaft bearing had more end float than the QE2, which looked rather a challenge to repair. 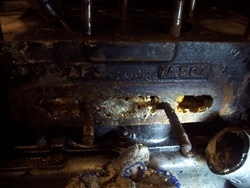 Magneto looked shiny and new but when plug number one sparked the engine was telling me that number four was on compression stroke – no wonder it would not start. 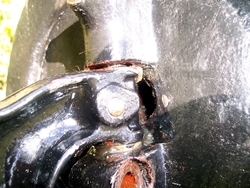 Away from the engine the carden (prop) shaft was in excellent shape but the attached flexible coupling – oh dearie me. Clonking under the car? drive coupling may be slightly tired! Now with the engine and box out it would be nice to have a four speed box fitted simply to climb up the local Cornish Alps with the traffic, rather than at the head of a long tail back flat out in second at 20 something mph. Those of you with three speed boxes leaving Truro will concur; all roads out go up, and up. 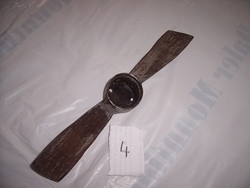 Looks like a standard fan but this one was made from tin! The four speed box went to one of our Club's technical experts for a check up to be followed by the engine for ‘heart testing’ in due course. There is nothing worse than refitting the engine and then finding problems, been there and got the tee shirt. Needing new valves anyway I decided to change them from the split collets to pin type as working upside down fitting collets is a ‘never again’ job. One of my pictures will show why! No untoward problems other than the camshaft still trying to depart through the front cover, doctors appointment time. just find another one and fit that - note the extras! Another technically able member produced an adaptor to fit to my shortened Hardy Spicer prop shaft and the original flexible coupling no longer being needed should improve things. Rivet counters may be unhappy but driving pleasure or authenticity can clash sometimes. Engine rebuilt, well nearly, so time to collect the engine. The camshaft bearing received a modified bolt to keep it within the engine and then the engine slowly came to life on the bench tester. Mind you 12 volts through the starter woke up even the sleepiest parts after their ‘rest’. The gearbox was test fitted after more than a little work by the doctor, repairing another example of ‘working well until taken out,’ yeah right! All appeared fine except that the clutch was solid (another worthwhile check before fitting back into a car). 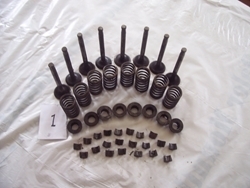 This time it appeared to be with the brand new clutch fingers which were a slightly different shape so they were modified to roller operation and I can say a well worth doing job, as clutch progression is gentler – for a Seven that is. Fitting the engine and different box proved rather a hassle compared to when I did the same to my Chummy all those years ago - rose tinted glasses? Still, job done eventually, and time for a road test becoming imminent, but before then the brakes were checked out, as stopping to me is more important than going. Old worn out parts mixed with new appeared again as on three corners the shoe pull off springs were good but the front left corner had completely clapped out springs which let the brakes come on when turning left. Hmm. So your car tries to slow when going round bends? 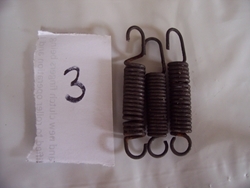 Could be weak brake shoe springs like these, less clapped spring in the centre. Road test day came and David once again rode shotgun, actually someone to help push to the side of the road if/when a ‘failure to proceed’ happened. Go department – adequate. Stopping – as per normal Seven. Going round bends and steering over bumps – a dire need for improvement here as the expression ‘handles like a galleon’ springs to mind. Back to the garage for ‘work ongoing’ then! Even with the car back in the garage I was no further forward as to why the handling left everything to be desired until I placed axle stands under the cross member to watch the spring and axle lower with the trolley jack, only they didn’t. Something must be a tad stiff, but what? Seized spring sprang to mind (ha-ha) so a little dismantling (not disassembly, horrible modern word) found the spring to be under tension with solid shackle pins. Now I have come across, over the years, odd shaped pins, pins happily wearing away the spring eye, spring eye wearing away the shackle even, but perfect looking pins locked solid, never. The poor spring must have given a sigh of relief at being able to flex again. The time had come for the complete front axle to have a spell on the workmate for ease of working by just undoing a few more nuts, bashing a couple of tapers blah-de-blah. Why do tasks like this never go the way a workshop manual leads us to believe? The axle did give in eventually and leave its home of the last 90 years, or more like I felt 90 after all the effort involved. The autopsy was, shackles seized solid, kingpins oh so tight (but not worn) and kingpin shims departed to foreign climes making any MoT tester to gleefully hand out an instant failure with such a large amount of lift. I can only presume the price of grease was too much on the wallet, or a non grease gun owner even? Fortunately I had another with bare stub axles in the store and on checking this one found it to be in far better condition to the axle just taken off. So the great swap over and assembly game took place, this time even the spring actually did it’s stuff. So time for another road test. Much better handling at last and not bad for a Seven. Worryingly the radiator boiled with the car back in the garage, come on now it’s me who usually gets all hot and bothered not the car. This time the fan was turning at the speed of a giant windmill, the pulley spinning happily on the crankshaft following a taper pin departure somewhere on the A390. If ‘its you’ who collects one in a tyre, I do not want the pin back thanks. What’s next I wonder? Don’t forget, this saga was the result of a non-CA7C owned car that was reputedly running fine until it stopped, some times it must be an easier option to buy a known poorly car and check everything automatically rather than play blind mans bluff with a so called good, but unknown runner. A good job I just love a challenge, but no more cars, that’s it, not ever again, honest! Everything finished ………… tomorrow possibly? Or may be a little later. Other than when purchased covered in dust the car looks the same, underneath has changed a bit though. This article, written by Peter Burton, originally appeared in Seven Focus May 2018 pp 18-22 and June 2018 pp 6-7. Sadly, Peter passed away in Jnauary 2019 after a long illness.